Bright Eye Solar is committed to providing you with the highest quality solar electric installation for your home or business. We are an approved and listed installer for the Pennsylvania Sunshine Grant, we have gained our IREC accreditation, and each installer has successfully completed NABCEP certified training for photovoltaic systems. We also have a Journeyman electrician on staff who works on every installation. Educate our customers on photovoltaic systems and solar panels. Provide thorough and detailed site evaluations and proposals to determine if a property is a good candidate for solar energy. Deliver top-quality solar electric products at competitive prices. Ensure customer satisfaction and provide exceptional customer service to all of our solar power customers. Meet or exceed all electrical and building codes and best wiring practices to ensure safe and efficient solar power systems. Monitor and manage solar electric systems after the installation and provide affordable periodic maintenance cleaning and inspection. Bright Eye Solar provides solar panel installation services for commercial and residential customers in Pennsylvania, Maryland, New Jersey, New York, Delaware, Massachusetts, and Connecticut. Contact us today to learn more and schedule a free consultation! 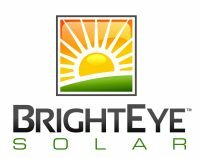 Bright Eye Solar is an LLC. We carry two million dollars of liability insurance and all employees have workers compensation as mandated by law. We are also registered in Pennsylvania as a home improvement contractor with the Attorney General’s Office.